Searching for a match with POSIX regular expressions is done using the ereg() function. You provide a pattern, a string to search, and a variable name that receives the results as an array. The first element in this array is the complete match; the next elements are all matched subpatterns (defined in parentheses), from inner patterns to outer patterns, from left to right. The preceding code shows this, using the function phpversion() that returns the installed version of PHP. 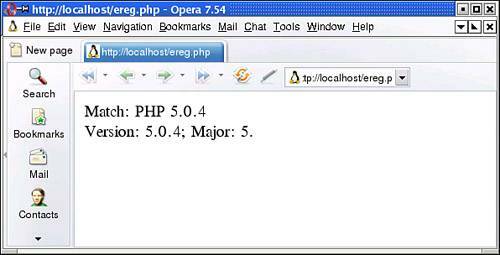 See figure for the output of this script when using PHP 5.0.4. Splitting the PHP version using regular expressions. The + symbol after the last [0-9] expression in this example takes care of PHP versions like 4.3.11. If you do not want the search to be case sensitive, append an i to the function name: eregi().